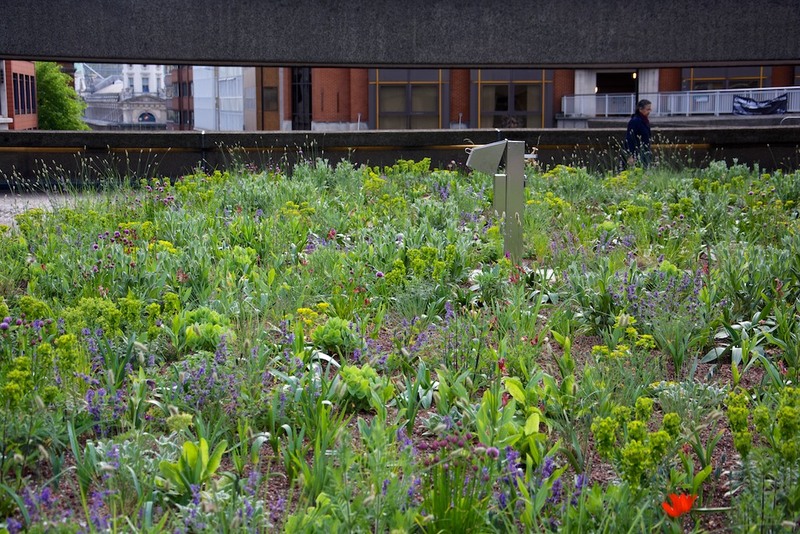 The steppe plantings are the main feature of the transformation project at The Barbican, and these plantings form the basis of the other planting types too. In nature, steppes or steppe grasslands occur in dry regions with continental climates (hot dry summers, cold winters). Plants are adapted to these harsh conditions. 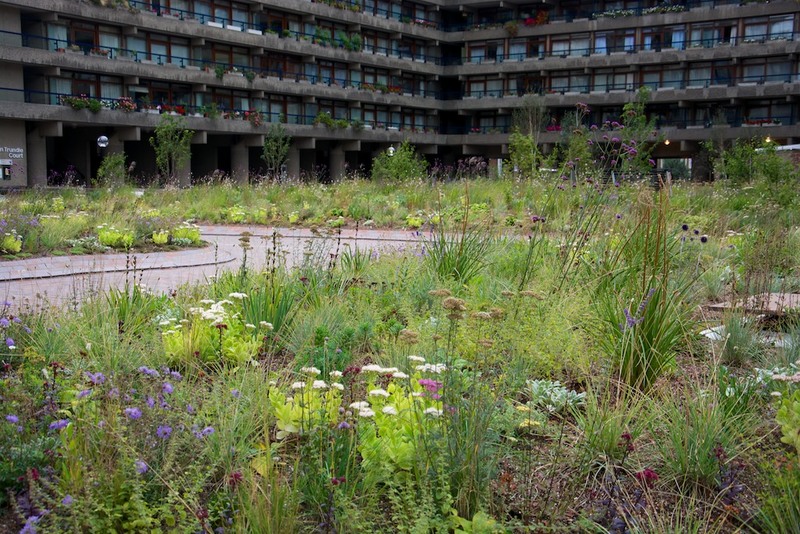 The plantings at The Barbican are not attempting to copy any naturally-occurring steppe grasslands, but are a designed version, using perennials and grasses from steppe regions or dry grasslands and meadows. A matrix of tough, drought-tolerant grasses (Sesleria nitida, Helicotrichon sempervirens, Melica ciliata) creates the backdrop to a long succession of flowering species through spring to late summer. 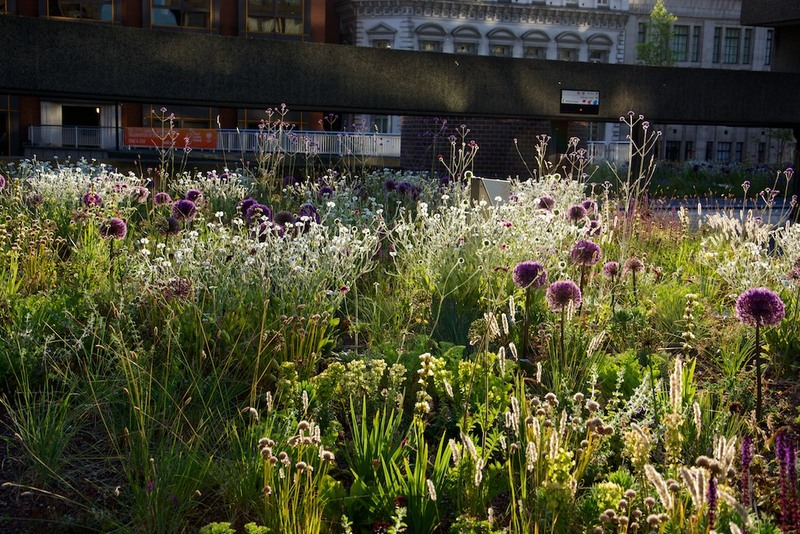 Later in the summer, and into autumn and winter, the emphasis switches to beautiful textural contrasts as foliage and seed heads take over the display. Tulipa turkestanica flowering amongst the new growth of the grasses and perennials. In May the vibrant colours of early spring fade away and the real character of the dry steppe meadows starts to take hold. 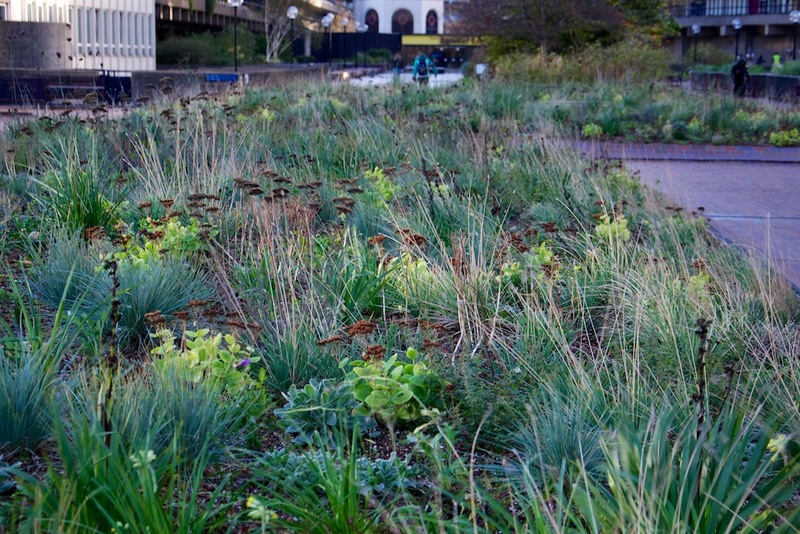 Because the plants in the mixes naturally come from dry habitats, there is a similarity in the colours – grey leaved grasses and grey or silver leaved perennials, mixed in with the fresh green growth of all the emerging plants, give a grey-green sheen to the plantings. Already the layering is working – the rapidly expanding perennials are hiding and over-topping the dying back remains of the spring bulbs and early perennials. Flower colours tend to be blue or pink, and combined with the foliage colours, produce a really coherent visual effect over the whole area. It is still possible to see the stars of April and early May in the vegetation – the tulips are over and the Euphorbias are fading. The plantings are now really taking on the steppe-meadow look. For more photographs and details of the plantings in May, click here. 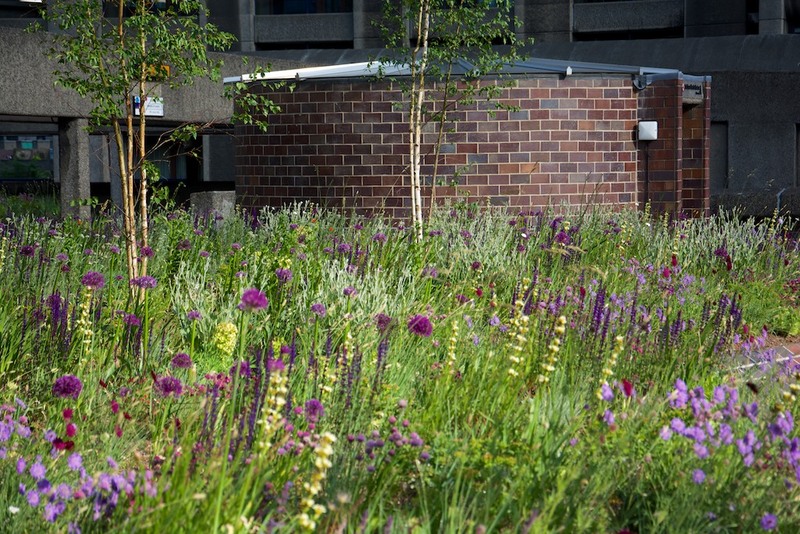 Scabiosa columbaria, Allium schoenoprasum, Nepeta ‘Walker’s Low’ and Armeria maritima. For more images of the steppe plantings in May click here. For more photographs and details of the plantings in May, click here. 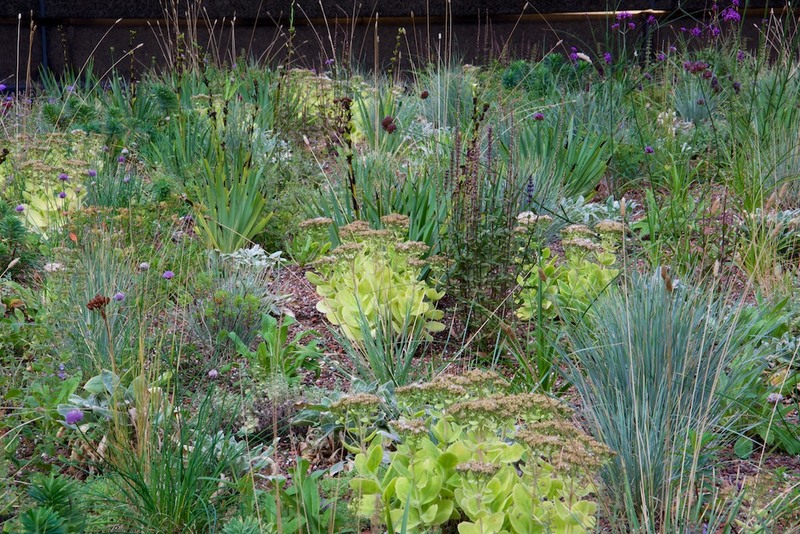 The steppe plantings are full of textural details and contrasts. For more photos of the plantings in mid-late May, click here. Early to mid June is a point of transition: this time sits at the cusp of a dramatic change in the plantings. Many of the character species from the last month are still flowering, such as the Chives and Sea Thrift, and some such as Euphorbia characias ‘Humpty Dumpty’ remain prominent. They are joined by several new players, as the layers build. But very soon, the colours will switch from the soft pinks and blues of the past weeks. 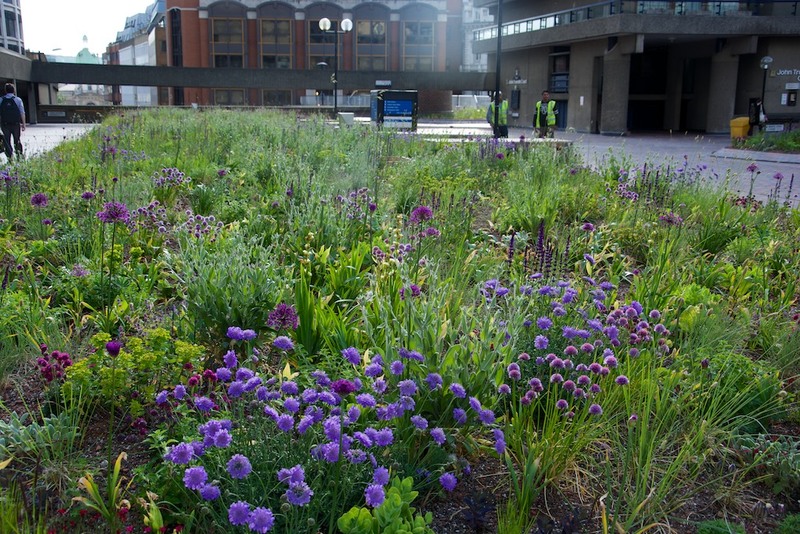 For more photographs and details of the steppe plantings in early June click here. Allium ‘Purple Sensation’ beginning to rise through the lower layers in the steppe plantings. 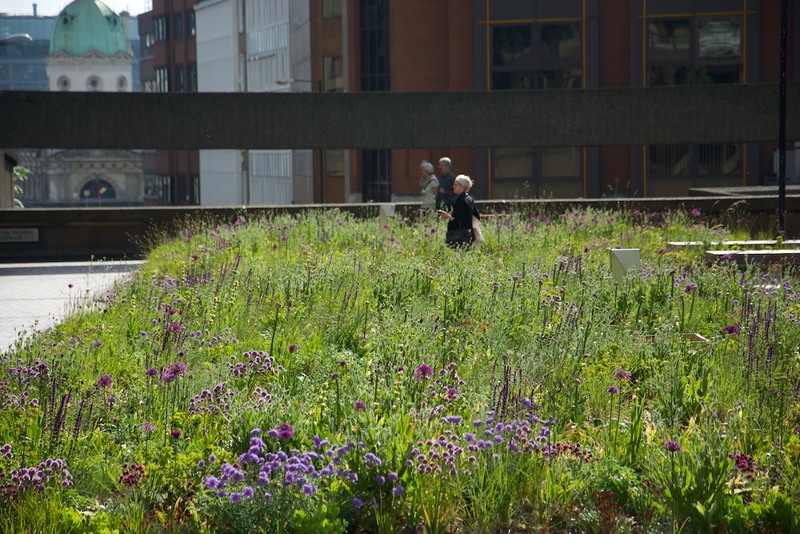 For more photographs and details of the steppe plantings in early June click here. Sisyrinchium striatum, and Salvia nemorosa ‘Caradonna’ adding height, with Allium ‘Purple Sensation’. For more photographs and details of the plantings in early to mid June click here. 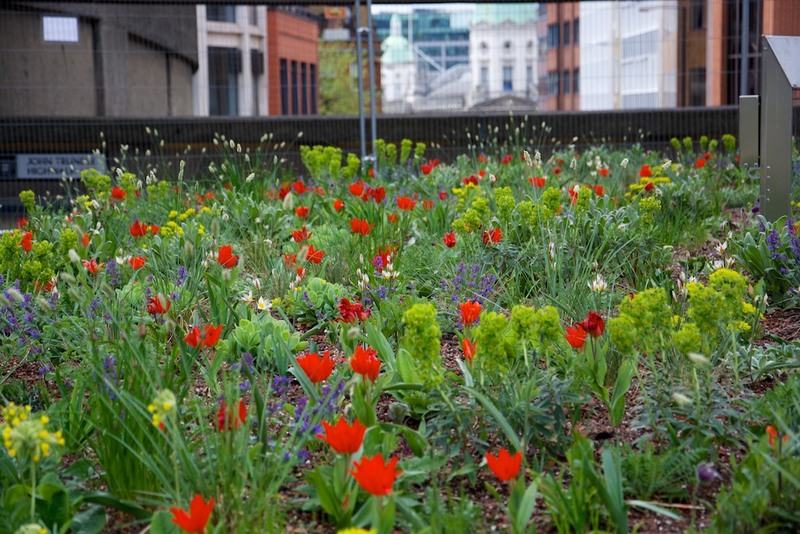 In late June and early July there is a hugely dramatic change to the plantings as further layers rise through to take over the visual display from the shorter-growing species of the spring and early summer. This coincides with a complete change of colour across the site. The Alliums ‘Globe Master’ and ‘Purple Sensation’ bloom at the same time as Lychnis coronaria ‘Alba’, forming a strong contrast of purple and white across the site. 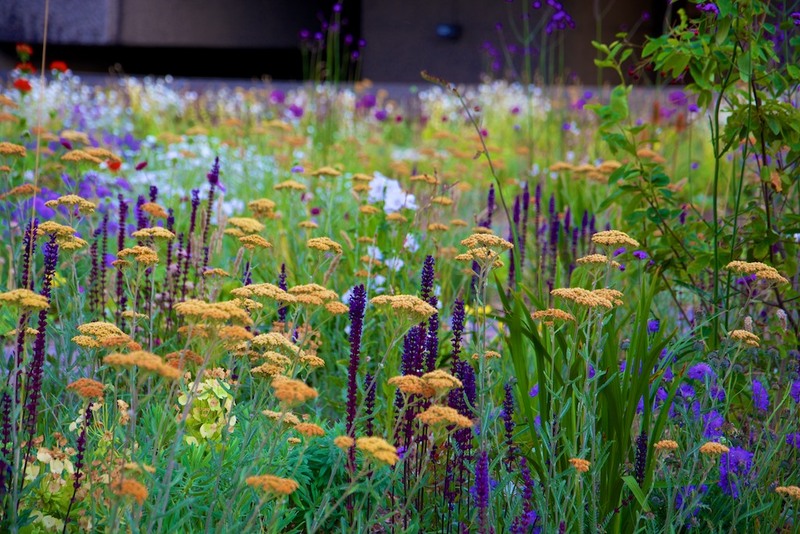 The orange-yellow flowering of Achillea ‘Terracotta’ begins – the Achillea sets the tone of the plantings for many months, and contrasts perfectly with Salvia ‘Caradonna’. 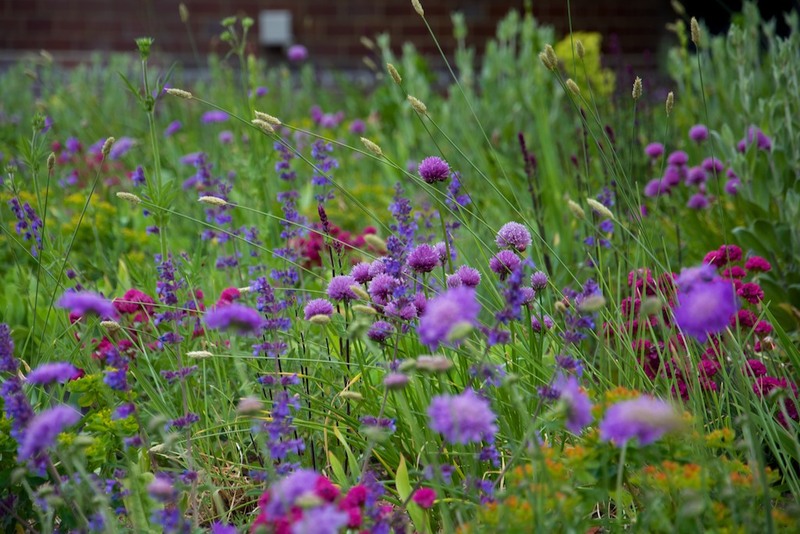 For more photographs and details of the steppe plantings in late June to mid July click here. Salvia nemorosa ‘Caradonna’ and Achillea ‘Terracotta’, with white Malva moschata ‘Alba’ and Lychnis coronaria ‘Alba’. For more photographs and details of the plantings in late June to mid July click here. From mid July and on into August there is the next mass transformation across the site as the next wave of plants takes over. The key plants at this time are Kniphofia ‘Tawney King’, which matches perfectly with Achillea ‘Terracotta’ still in full flower, but now the colour has changed from orange-yellow to a more faded yellow. Crocosmia ‘Emberglow’ is a vibrant red, and this is a long-performer – not with the flowers, but the seed heads are great for the winter, and the foliages takes on nice autumnal tones. A fantastic contrast with the yellow, oranges, reds and browns are the intense blue globes of Echinops ‘Veitch’s Blue’. The seed heads of the earlier flowering alliums are very prominent. Some of the plants from earlier in the summer are still visible, such as Salvia ‘Caradonna’, Lychnis coronaria ‘Alba’. Verbena bonariensis begins its very long flowering period. In mid to late July the strong oranges, purples and whites of earlier in the summer transform yet again to a mix dominated by yellows, reds and blues. And as the season moves on towards late summer there begins to be a real sense of the steppe plantings ripening and maturing. 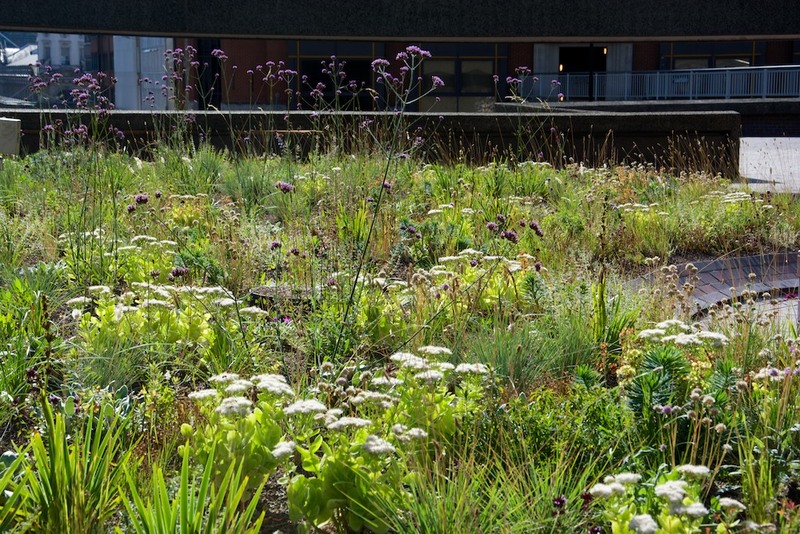 For more photographs and details of the steppe plantings in mid to late July click here. 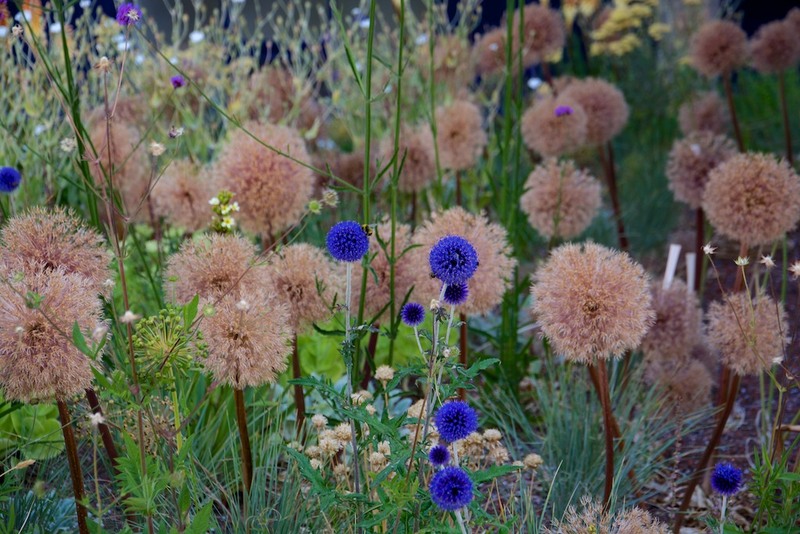 Echinops ‘Veitch’s Blue’ with the seed heads of Allium ‘Globemaster’ and the fading heads of Lychnis coronaria ‘Alba’. 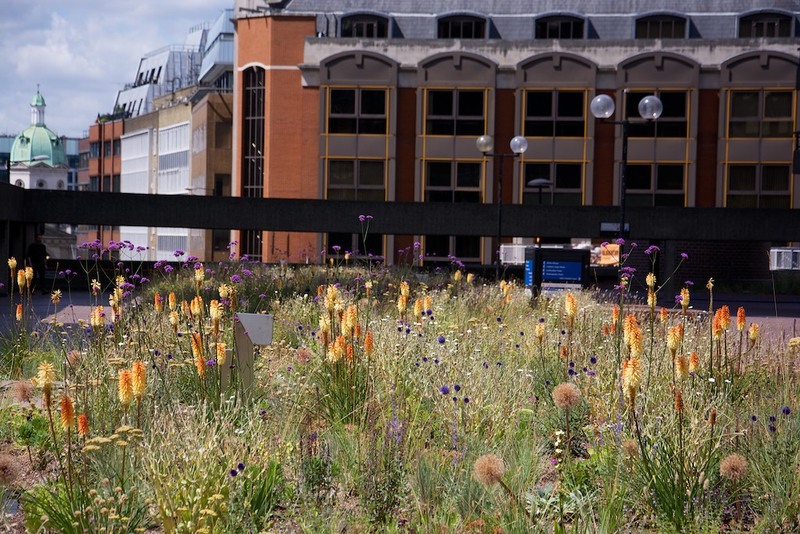 For more photographs and details of the steppe plantings in mid to late July click here. The upright form of Kniphofia ‘Tawney King’ makes a strong contrast with the globular seed heads of the Allium. The red is Crocosmia ‘Emberglow’. For more photographs and details of the plantings in mid to late July click here. 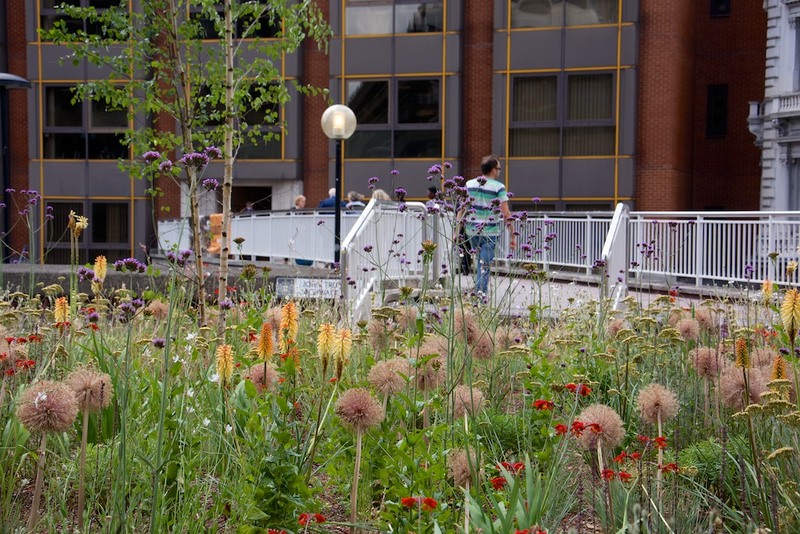 From August onwards there is a gradual transition from bright vibrant colour to more of a focus on the complex interactions of different foliages, plant forms and seed heads. That’s not to say there isn’t any flowering, far from it. But its more that the turn of the summer towards autumn brings with it a sense of ripening. This is entirely natural with steppe-type plantings. The main growth period for steppe and other plants from dry places tends to be in the spring to mid-summer, and growth and flowering tends to slow down into August when the driest, hottest and most stressful conditions are to be expected. In August the flowering of Sedum ‘Snowburst’ begins, and this plant then features prominently for the rest of the year. Some selective maintenance has removed some of the seed heads and dead stems of early and mid summer flowering plants. For more photographs and details of the plantings in August click here. Late flowering Kniphofia ‘Tawney King’ amongst the ripening seed heads and foliage textures of late summer. For more photographs and details of the plantings in August click here. Scabiosa columbaria continues to flower profusely, here with the seed heads of the grass Melica ciliata. For more photographs and details of the plantings in August click here. In September there is another colour transition across the site. The yellows and oranges of the summer give way to a haze of delicate white as Gaura lindheimeri comes into flower. On its own, this is not a dramatic or impactful plant, but it is scattered throughout several of the mixes, and weaves its way amongst the other plants: the cultivar name ‘Whirling Butterflies’ is really apt. 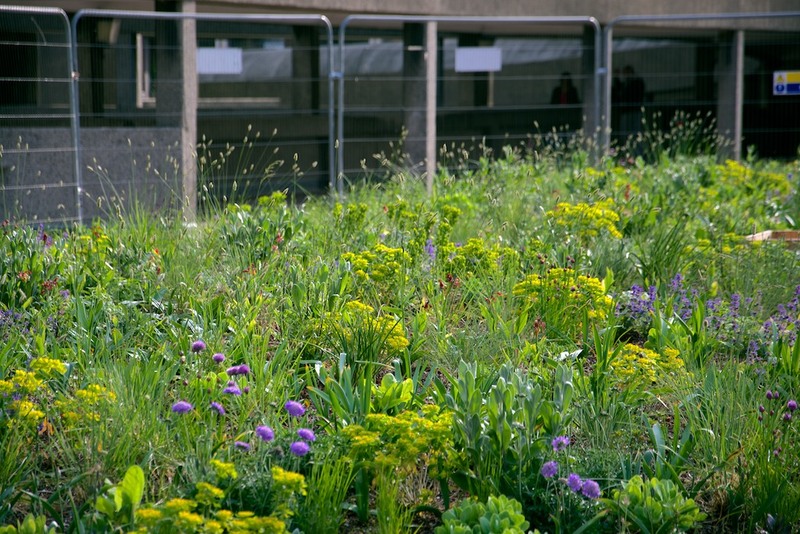 In the main steppe beds another transition is taking place: the balance is well and truly moving towards foliage textures and seed heads, and the strong colours of the summer are giving way to the grey-greens of the leaves of the drought-tolerant plants. It is at this point that carefully considered maintenance becomes very important. As each species starts to become untidy or unsightly, they are cut back. This really only involves one or two species, and most remain. But from this point onwards the beds start to thin out a little, and the original structure of the planting starts to become apparent again. 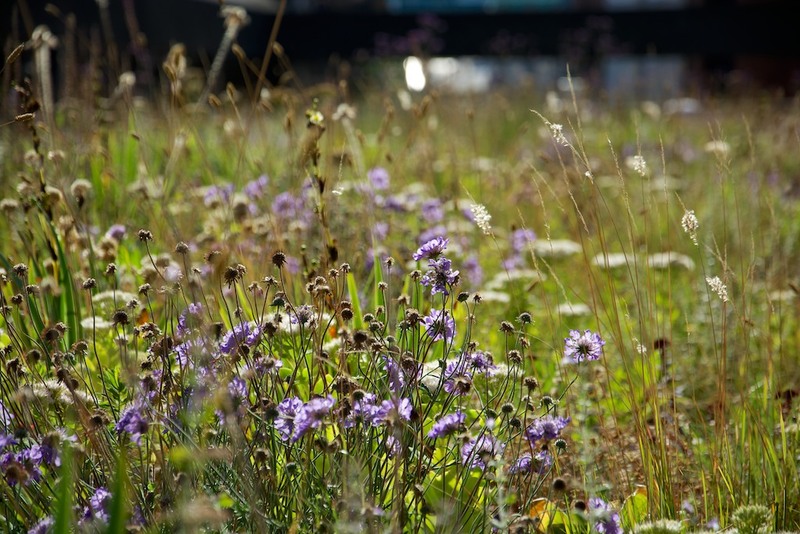 For more photographs and details of the steppe plantings in September click here. It is at this point that carefully considered maintenance becomes very important. As each species starts to become untidy or unsightly, they are cut back. This really only involves one or two species, and most remain. But from this point onwards the beds start to thin out a little, and the original structure of the planting starts to become apparent again. 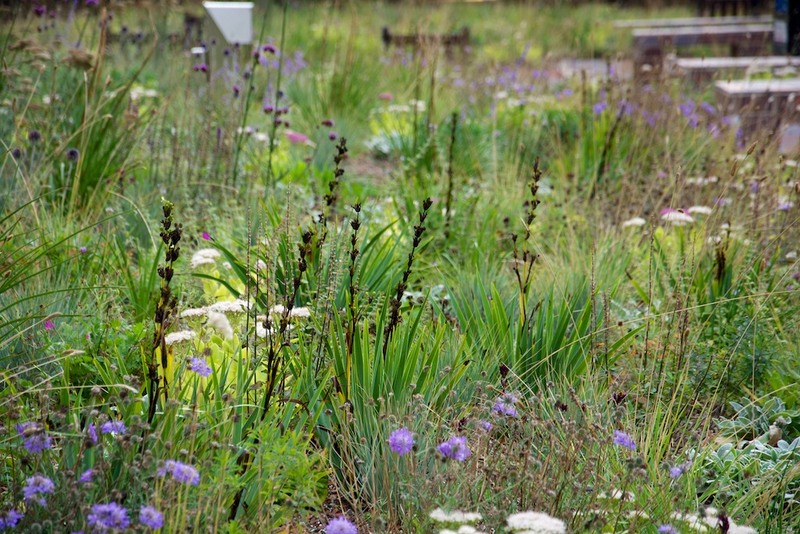 For more photographs and details of the steppe plantings in September click here. Seed heads become increasingly important, and form and texture takes over from colour as the main visual focus, as in this example of the black seed heads and former flower stems of Sisyrinchium striatum. For more photographs and details of the plantings in September click here. When I planned the plantings I always told myself that if the areas still look good into October, then the whole scheme will have been a success. In fact, I have been overwhelmed at how the plantings have been full of visual interest virtually from their very first day, continuously on into autumn. Of course, it is impossible to keep up a full-on flowering display for this length of time. As noted in the previous month, steppe plantings, and plantings for dry places generally, tend to flower in spring through to mid summer, and then start to fade away. 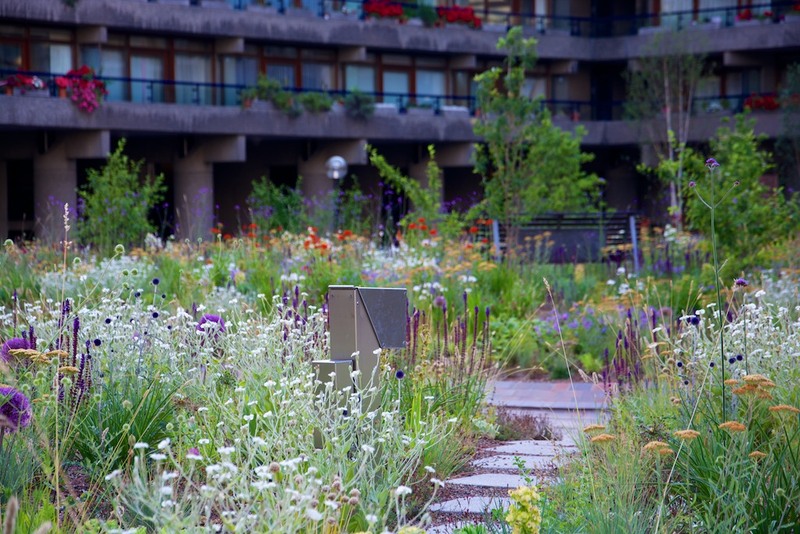 The Barbican plantings have been designed to go on for much longer this, but even so, the main flowering events are now over. 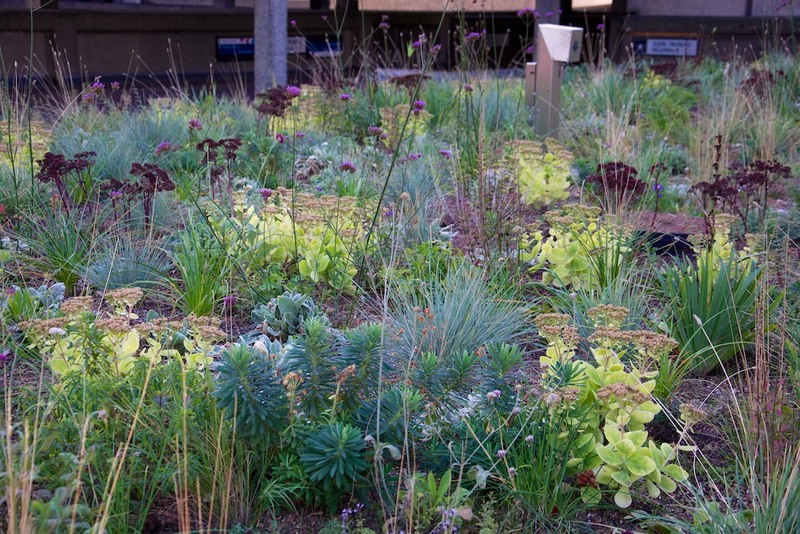 As the light begins to lose its summer intensity, the steely blue-grey sheen of the plantings is becoming very effective, and Sedum ‘Starburst’ has an almost luminous fluorescent quality with its yellow-green leaves. Now more than ever, the complexity of the plantings becomes apparent, with the seed heads and grass foliage providing a really beautiful impression. The value in keeping the steppe plantings relatively short and uncongested becomes clear. 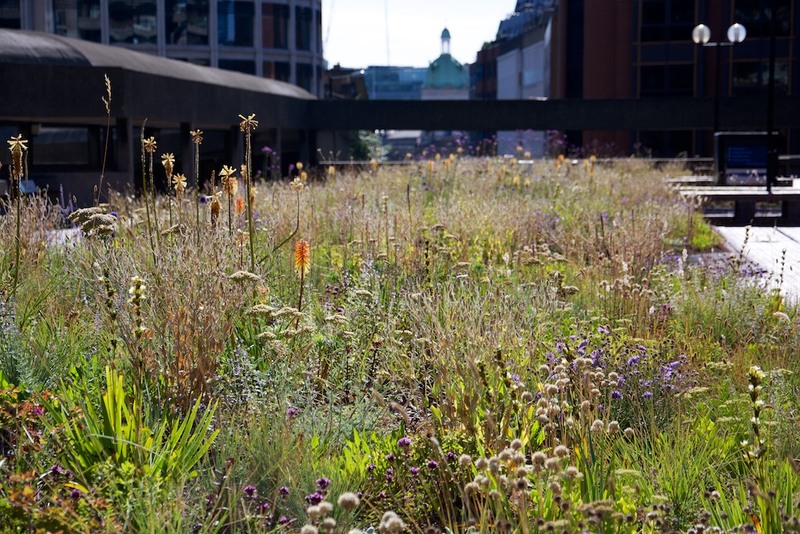 For more photographs of the steppe plantings in October, click here. The removal of some of remains of the bulkier earlier-flowering species has given a great sense of space and openness to the plantings. Sedum ‘Starburst’ is luminous in the intensity of its pale yellow leaves, and the dark seed heads of Sedum ‘Jose Aubergine’ are also a feature. The steely blue-grey needle leaves of the grass, Helicotrichon sempervirens, stand out, and the original setting-out distributions of these plants really becomes apparent. 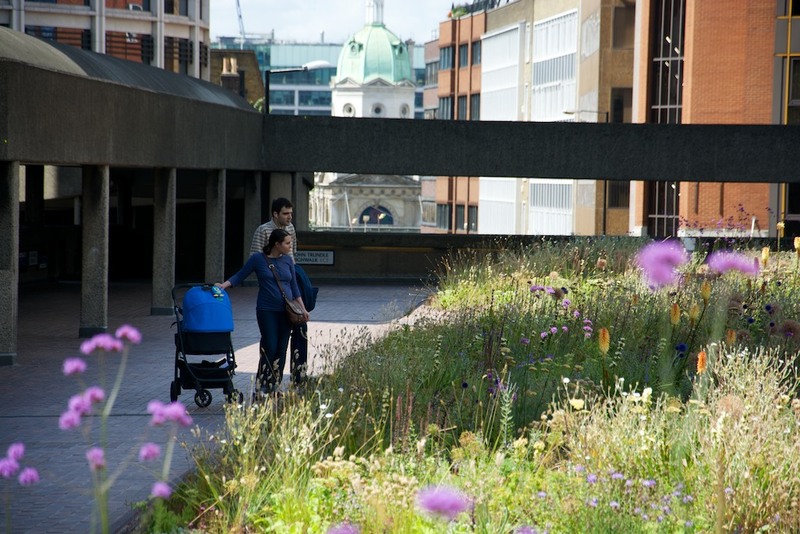 For more photographs of the steppe plantings in October, click here. Sedum ‘Starburst’ seems to glow in the darker days of early winter . 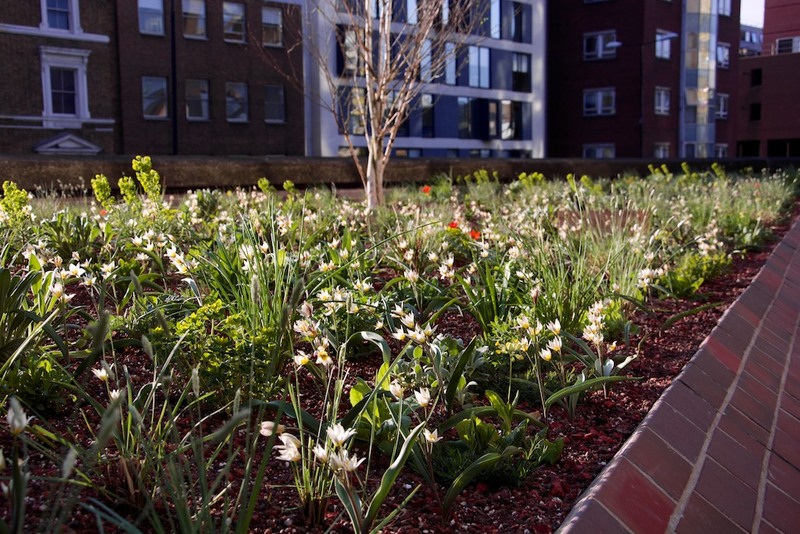 For more photographs and details of the steppe plantings in November and December click here. The interplay of foliage colours, and the contrasts between the forms, textures and structures of plants are at the fore. The grass, Helicotrichon sempervirens, is an important winter feature of the steppe beds. For more photographs and details of the plantings in November and December click here. In November and December the interplay of foliage colours, and the contrasts between the forms, textures and structures of plants are at the fore. 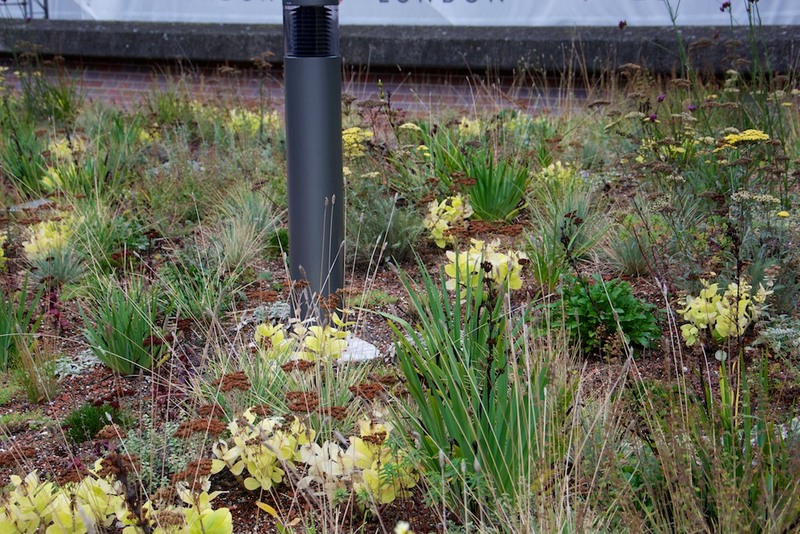 For more photographs and details of the steppe plantings in November and December click here. 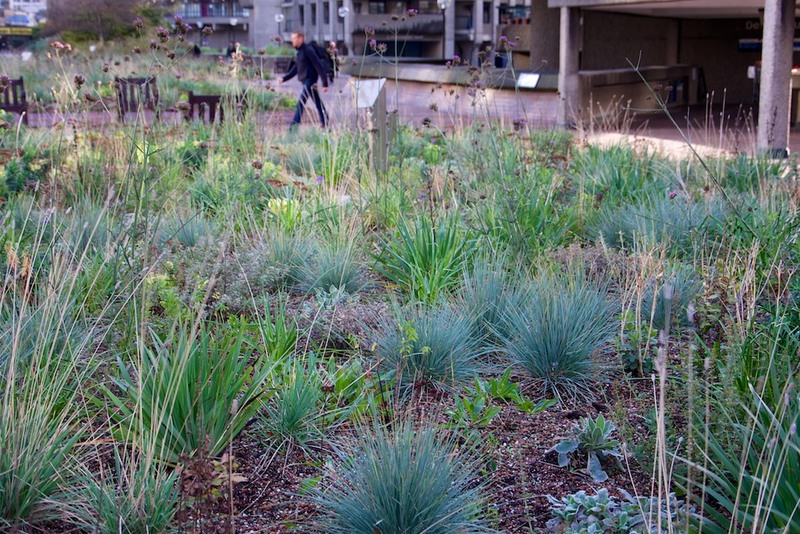 The grass, Helicotrichon sempervirens, is an important winter feature of the steppe beds. For more photographs and details of the plantings in November and December click here.